KENNEDY SPACE CENTER, FL--Outgoing space station commander Dmitry Kondratyev, Italian astronaut Paolo Nespoli and Catherine "Cady" Coleman undocked and returned to Earth Monday, pausing briefly to snap long-sought pictures of the station with a space shuttle attached before dropping out of orbit and landing in Kazakhstan to close out a 159-day voyage. 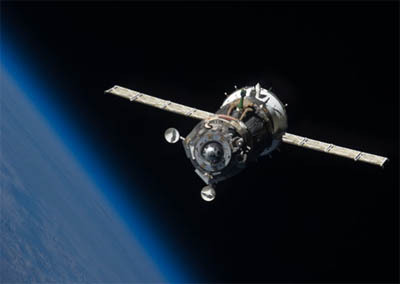 Sailing 220 miles above eastern China, the Soyuz TMA-20 spacecraft undocked from the Russian Rassvet mini-research module at 5:35 p.m. EDT (GMT-4), backing straight away from the space station. In a dramatic break with normal practice, Kondratyev halted the Soyuz's departure at a distance of about 600 feet directly behind the lab complex to give Nespoli a chance to capture what likely will become one of the signature images of the shuttle-station era. Black-and-white television views from the Soyuz showed the two spacecraft against the limb of the planet as they flew in concert at five miles per second. Similar photos of the shuttle Atlantis undocking from the Russian Mir space station were shot 16 years ago by the crew of a Soyuz spacecraft but until Monday, there were no such views of the shuttle and the International Space Station. But Nespoli's high-resolution photographs and high definition video will not be seen until Tuesday or Wednesday, after compact camera cards are copied on the ground and flown to Moscow and Houston. With the photo survey complete, Kondratyev and his crewmates rigged the Soyuz for re-entry, firing the ship's braking rockets at 9:36 p.m. to begin the descent to Earth. The three modules making up the Soyuz TMA-20 vehicle separated at 10:01 p.m. and the descent module with the returning station fliers slammed into the atmosphere at an altitude of about 62 miles at 10:03 p.m. The fiery re-entry appeared to go smoothly and a large parachute inflated as planned as the spacecraft fell toward the landing zone near Dzhezkazgan, Kazakhstan. The final moments of the return to Earth were captured in live video and at 10:27 p.m. (8:27 a.m. local time), the capsule touched down, closing out a mission spanning 159 days, seven hours and 17 minutes since launch Dec. 15. "This was a textbook entry for Dmitry Kondratyev, Paolo Nespoli and Cady Coleman," said NASA mission control commentator Rob Navias. "All of the functions of the Soyuz TMA-20 were by the book, no issues reported." The descent module landed upright and Russian recovery forces rushed to the scene to assist the returning station crew, along with U.S. and Russian flight surgeons. All three space fliers were in good spirits, smiling and chatting with support personnel and sharing a satellite phone to call family members back home. "Hey, how are you guys?" Coleman could be heard saying to her family. After initial medical checks, Kondratyev, Nespoli and Coleman were expected to fly by helicopter to Karaganda, Kazakhstan. Coleman and Nespoli then planned to board a NASA jet for a flight back to Houston while Kondratyev heads for Star City near Moscow. Nespoli photographed the space station through a porthole in the Soyuz TMA-20 habitation module starting about 15 minutes after undocking. Five minutes after that, at 5:55 p.m., Expedition 28 commander Andrey Borisenko monitored space station rocket firings to kick off a 15-minute, 129-degree turn, presenting a side-on view to the Soyuz with the shuttle in profile on the left and the Russian segment of the lab on the right. In all, Nespoli had about 25 minutes to complete his work before Kondratyev fired the Soyuz TMA-20's thrusters to depart the area, keeping the ship on track for re-entry and landing. The normal practice for a Soyuz undocking calls for all three crew members, wearing Russian pressure suits, to be strapped into their seats in the spacecraft's central descent module. The forward habitation module and the aft propulsion section are jettisoned just before re-entry to burn up in the atmosphere. As such, the hatch between the descent module and habitation module is closed and leak tested before undocking. For the photo shoot, the hatch was closed for undocking as usual, but re-opened a few minutes later so Nespoli can use the porthole in the forward compartment. A few minutes after a separation "burn," was was expected to remove digital photo cards from his cameras and make his way back into the cramped descent module, taking the seat to Kondratyev's left. The hatch then was to be sealed for leak tests to verify the integrity of the central command module. "This is the first time we've ever done something like this where we have a Soyuz undocking during a shuttle mission," said space station Flight Director Derek Hassmann. "There are a number of challenges associated with doing that. There were engineering challenges in terms of the analysis we needed to do to make sure it was safe for the Soyuz to undock relative to loading on the solar arrays and other constraints." Another complicating factor was an offset sleep schedule that had the Endeavour astronauts, plus Expedition 28 flight engineer Ronald Garan, following one sleep cycle while the departing Expedition 27 crew, along with Borisenko and flight engineer Alexander Samokutyaev, going to bed several hours later. "On a station docked mission, this is the first time we've had offset sleep schedules and it's been a little bit of a challenge to manage the communication loops to the crew," Hassmann said. "But we're getting better at that as the days go by, so I'm really happy the way this has worked out." Barring a mission extension, Endeavour is scheduled to undock May 29 for a landing back at the Kennedy Space Center on June 1. Borisenko, Samokutyaev and Garan will have the space station to themselves until June 9 when three fresh crew members -- Soyuz TMA-02M commander Sergei Volkov, Michael Fossum and Satoshi Furukawa -- are scheduled to arrive following launch June 7 from the Baikonur Cosmodrome in Kazakhstan.